Set in Whitby, 2 km from Whitby Abbey, Abbey Holiday Accommodation offers accommodation with free WiFi and a terrace. There is an in-house restaurant, which serves Mediterranean and Greek cuisine and also offers vegetarian and halal options. Fishing can be enjoyed nearby. Popular points of interest near the bed and breakfast include Captain Cook Memorial Museum, Whitby Lighthouse and Whitby Museum. Abbey Steps Tea Rooms and Guest House is set in Whitby, 200 metres from Whitby Abbey and 2.1 km from Captain Cook Memorial Museum. Located around 2.6 km from Whitby Lighthouse, the guest house with free WiFi is also 3 km away from Whitby Museum. The property is 4.3 km from Whitby Pavillion. Sneaton Castle is 4.3 km from the guest house. The stylishly furnished Abbotsleigh of Whitby offers elegant bed and breakfast accommodation 2 minutes' walk from the seafront. The stylishly furnished Abbotsleigh of Whitby offers elegant bed and breakfast accommodation 2 minutes' walk from the seafront. With a 4-star gold rating from the AA, this North Yorkshire guest house provides free parking. Each room at Abbotsleigh has been individually styled, and has its own unique furnishings. 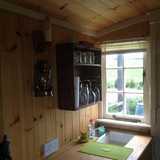 All have a flat-screen TV, iPod dock and tea and coffee facilities including a coffee machine and homemade biscuits. Each room has luxury bedding and an en suite bathroom with shower, hairdryer and high-quality toiletries. An award-winning breakfast menu includes a buffet selection of fresh fruit, cereals, homemade bread, yoghurt, preserves and honey. There is a cooked selection with bacon, local sausages, black pudding and free-range eggs, and tea, coffee and fruit juice. Located in Briggswath, Whitby, Aldebaran B&B is 1.9 miles from Sneaton Castle and 3.1 miles from Whitby Abbey. The property offers garden view and also views of the Esk Valley. The property offers newly renovated rooms that comes with a flat-screen TV, a fridge and a seating area for your convenience. Breakfast is served as a complimentary Continental Breakfast Basket. Extras include free toiletries, hair dryer, iron. An iron board is available upon request. Free WiFi is featured throughout the property and a free private parking area is also available. The Sleights Train Station and bus stop is only a short walk away. Guests can enjoy various activities in the surroundings, including fishing and hiking. Offering garden views, a garden and free WiFi, Amaroo B&B is located in Whitby, 7 km from Whitby Abbey and 5 km from Whitby Museum. Some units have a terrace and/or a patio with mountain views. A continental breakfast is served every morning at the property. Whitby Lighthouse is 6 km from the bed and breakfast, while Whitby Pavillion is 6 km away. Anchorage House is situated in Whitby, 2.6 km from Whitby Abbey. Located around 300 metres from Whitby Museum, the guest house is also 1.2 km away from Captain Cook Memorial Museum. Attractions in the area include Whitby Lighthouse, 1.2 km away, or Whitby Pavillion, located 1.6 km from the property. Guests at the guest house can enjoy a Full English/Irish or a vegetarian breakfast. Sneaton Castle is 2 km from Anchorage House. Set in an 1895 Victorian house, this charming guest house offers modern accommodation whilst retaining its original features. It offers free WiFi and freshly cooked breakfasts, 8 minutes' walk from Whitby Train Station. En suite rooms at Autumn Leaves Guest House are elegant and include a plasma TV with satellite channels, a seating area and hospitality tray. Breakfast is served daily in the delightful oak panelled dining room with open fire. Ingredients are locally sourced and special dietary requirements can be catered for. Set across from Pannett Park and Whitby Museum, the Autumn Leaves is a 10-minute stroll from the town centre and Whitby Harbour. The bars, shops and restaurants of Flowergate and Skinner Street are 2-3 minutes away by foot. Autumn Leaves Guest House has free public parking nearby and is less than 15 minutes' walk from the beach and Pavilion Theatre. Bagdale No4 is one of two annex buildings to Bagdale Hall Hotel. Situated just a 10-minute walk from Whitby Beach, Bagdale No4 Annex is a Georgian townhouse featuring free onsite parking, free Wi-Fi and rooms with high ceilings. 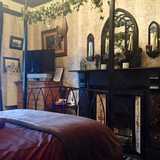 The hotel is located on the edge of North York Moors National Park. A private bathroom, TV and tea/coffee making facilities are featured in all Bagdale rooms, and some have four-poster beds. Locally sourced meat, fish and vegetables are used to create the seasonal dishes served in the onsite restaurant. A full English breakfast is also provided, as well as vegetarian options. A large lounge and bar area are also available for guests to use. Whitby Abbey and harbour are just a 10-minute walk from the hotel, and the Captain Cook Memorial Museum is only 0.4 miles away. Bagshawes features accommodation with free WiFi and free private parking. Located around 1.7 km from Sneaton Castle, the bed and breakfast is also a 3-minute walk away from Captain Cook Memorial Museum. Local points of interest like Whitby Lighthouse and Whitby Museum are both reachable within a 6-minute walk. All units at the bed and breakfast are equipped with a seating area, a flat-screen TV with satellite channels and a private bathroom with free toiletries and a shower. The rooms feature a wardrobe. A Full English/Irish breakfast is served every morning at the property. Whitby Pavillion is a 7-minute walk from Bagshawes, while Whitby Abbey is a 10-minute walk from the property. The gothic guest house Bats and Broomsticks embraces Whitby's vampire connections, the town being the setting for much of Bram Stoker's 'Dracula'. Free WiFi and on-site parking is available. Guest rooms have a four-poster bed and a gothic-inspired theme. Each has a flat-screen TV with DVD player, and there is a bathroom with bath. A full English breakfast is served each morning at Bats and Broomsticks. Whitby is the venue for regular Goth Weekends, and offers Dracula-themed attractions. Elsewhere in the town, you can find the Captain Cook Memorial Museum and Whitby Abbey, and the Museum of Victorian Science is around 9 miles from this guest house. Situated within 3.2 km of Whitby Abbey and 800 metres of Whitby Pavillion in Whitby, Beach House offers accommodation with free WiFi. Some rooms are equipped with a TV and kettle, and other larger apartments have a fully equipped kitchen. All rooms have en suite shower room. Guests can enjoy a cooked breakfast in the breakfast room which is adjacent to the reception on Silver Street. A swimming pool and sauna are available there for a surcharge. Whitby Lighthouse is 1.2 km from Beach House, while Sneaton Castle is 1.9 km away. Offering a garden, Betsy the Shepherds Hut is situated in Whitby. Whitby Abbey is 6 km from the property. There is a kitchenette, fitted with a stovetop and bed linen is available. Sneaton Castle is 7 km from Betsy the Shepherds Hut, while Whitby Museum is 6 km away. A 2-minute walk from central Whitby and 10 minutes from the beach, Big Sky B&B offers friendly accommodation, free Wi-Fi and free parking. Rooms at the Big Sky B&B feature bright d�cor with wrought-iron beds, memory foam mattresses and goose down anti-allergen bedding. All rooms have satellite TV, and tea/coffee making facilities. A secure garage parking for bicycles and motorcycles is also available. Whitby Museum is a 5-minute walk away and Whitby Abbey and the harbor, famously featured in Bram Stoker's Dracula, are less than a mile away. The North Yorkshire Moors are within a 15 minute drive.